Iraq bought 36 metric tons of gold this month valued at about $1.56 billion in the largest purchase by a nation in three years. The Central Bank of Iraq acquired the metal to help stabilize the Iraqi dinar against foreign currencies, it said in an e-mailed statement. The country held about 29.8 tons of bullion as of August, according to data on the International Monetary Fund’s website. The latest addition was the biggest since Mexico bought 78.5 tons in March 2011. While nations purchased about 544 tons in 2012 in the largest accumulation in about five decades, acquisitions slowed to 369 tons last year, according to the London-based World Gold Council. Countries will continue buying amounts in the “hundreds” of tons, the producer-funded council said in February. Bullion prices rebounded 9.1 percent since December, after slumping the most since 1981 last year as demand for a store of value waned. 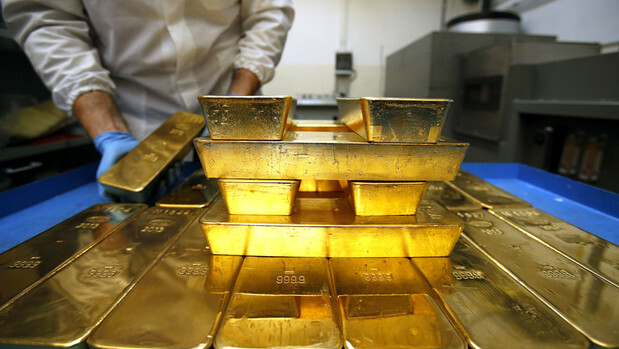 Gold for immediate delivery traded at $1,314.77 an ounce in London, after sliding 28 percent last year. It reached a record $1,921.15 in September 2011. Prices averaged $1,344.71 so far this month, valuing Iraq’s purchase at about $1.56 billion. Adding the amount Iraq said it bought in March to its reported holding in August would make it the 40th-largest holder by country, according to the WGC. The nation has no plans to sell metal from its reserves, Muneer Omran, director general of investments at the central bank, said in an interview in Dubai in January. Bullion had accounted for less than 2 percent of the nation’s total reserves, compared with about 70 percent for the U.S. and Germany, the biggest holders. “Demand from the likes of Iraq is important,” GoldCore’s O’Byrne said. “It doesn’t necessarily mean it will lead to higher gold prices per se, but it definitely means that there’s an ongoing demand from central banks that is likely to continue” and should support prices, he said. Mexico owns about 123 tons of the metal, according to the WGC. Turkey’s reserves, at about 488.6 tons now, expanded as much as 44.7 tons in July 2012. Bullion has been added to its balance sheet as a result of accepting gold in its reserve requirements from commercial banks. Holdings in gold-backed exchange-traded products reached 1,769.6 tons yesterday, the highest this year, data compiled by Bloomberg show. Assets fell to 1,735.4 tons last month, the lowest level since October 2009.